Madhu Krishna leads BMGF India’s initiative on Water, Sanitation and Hygiene. She has been a development professional for over 16 years, with a special focus on program design, evaluation, and policy and advocacy across public health, livelihoods, and women’s empowerment. 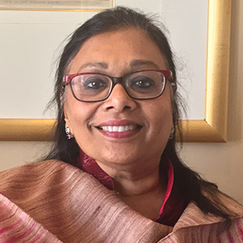 Before joining the foundation, Madhu worked for a number of organizations in the areas of maternal and child health, family planning and strategy formulation including FHI, Digital Green, Landesa, PATH, and Intrah Health. She has a Master’s degree in Social Sciences from the University of Delhi.